Vacker UAE is a top seller of Dehumidifier in the entire Middle East. Vacker UAE has built trust and successfully maintained core values and is a favorite portal for the residents of UAE, the Middle East when it comes to Air Cleaner products. 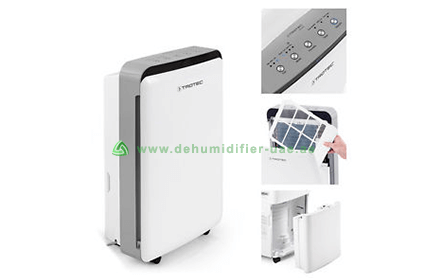 This article is to give you a brief Dehumidifier Overview, that can help in selecting the right kind of device. 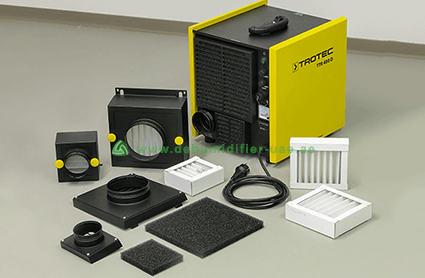 The dehumidifier products are manufactured by Trotec Germany - known for quality and standard. Trotec has been manufacturing Dehumidifiers since 1960's. A Dehumidifier is a device that works on the same principal as that of refrigeration and air conditioning that maintains the air temperature. The dehumidifier controls the moisture content that is present in the air. It accurately reduces humidity and maintains a clean, comfortable and healthy environment. The process of reducing moisture content from the air (humidity) is called Dehumidification. The Dehumidifier absorbs all the water content from the air in the room and keeps a dry environment. The fan, which is equipped in a dehumidifier takes in the wet air. When the air passes through, it comes in contact with the dehumidifier cooling coil. The collected air is then extracted and stored in a tank. Basically, the wet air gets sucked in and the dry air is exhausted. The dehumidifiers often have “Humidistats”. It is the Humidity Controller, by which the user can set humidity level as per his/her preference. Once the user adjusts the humidity level, the dehumidifier will then stop automatically. The automatic on and off system only works if the dehumidifier has a humidistat controller. In some devices, the humidistat is not provided, mostly in the dehumidifier which is used in industrial areas, construction sites or the rough environments. For continuous operation the humidistat is not featured, whereas for domestic environments, a humidistat is often used. The Humidity Controller can be used in different applications like domestic, industrial and commercial environments. High temperature can easily be felt, but higher humidity doesn't come to notice. The ignorance of controlling humidity can have a drastic impact. It will hamper various expensive items in your home. It can damage furniture and musical instruments. As mentioned earlier, humidity directly affects your health. It promotes bacterial growth and creates an unhygienic environment. The humidity can create illness and headache. Most of the time, humidity creates respiratory problems. The only solution to protect you from humidity is by choosing the right dehumidifier for your home with proper dehumidification capacity. With an extremely high moisture content in the air, one can barely feel comfortable. Too high humidity can create sweat and tiredness. The high-class products in your house get damaged easily. It also creates a problem of maintaining the pipes and infrastructure. If your room size is large, you can opt for a Commercial Dehumidifier which has a high dehumidification performance. It can dehumidify large areas. These dehumidifiers can effectively remove the moisture content and can keep the environment away from humidity. Vacker UAE offers dehumidifiers fit for commercial environments. The humidity in the industrial environments can be very annoying. The high level of humidity in harsh and rough environments can cause very serious problems. Many sensitive goods stored here can easily be damaged. Vacker UAE takes care of industrial environments and offers world-class Industrial Dehumidifiers. The dehumidifiers can be used for various applications. The Dehumidifiers provided by Vacker UAE are Condensation and Desiccant. Vacker UAE offers all types of Dehumidifiers for your home, office, commercial, industrial and all environments.